There are two options for travelling to Guernsey – by plane or by ferry. Whether you arrive at the airport or harbour the Fermain Valley Hotel is just a five to ten minute drive away, and our complimentary shuttle bus can be booked to pick you up if you don’t have your own transportation. Guernsey’s main town (and location of the harbour) is St Peter Port. It’s an unbelievably picturesque town with winding cobblestone streets, cafes and restaurants with al fresco dining, boutique shops, a castle surrounded by the sea, and of course plenty of fishing boats and yachts bobbing in the water. The island’s coastline is probably its most famous aspect. The West and North coasts are predominately made up of white sandy beaches, lapped by crystal clear waters. The East and South coasts feature dramatic cliffs and valleys, laced with beautiful footpaths, all offering breathtaking views of the sea and neighboring Channel Islands. The cliff top paths have regular branches off down to the sea if you fancy a dip, a bit of coasteering or even a surf! Inland the island has a rural French feel about it with small winding lines, granite houses, fields and small villages. Many of the smaller roads are designated ‘Ruette Tranquille’ with a speed limit of 15mph, so are perfect for exploring by bike. 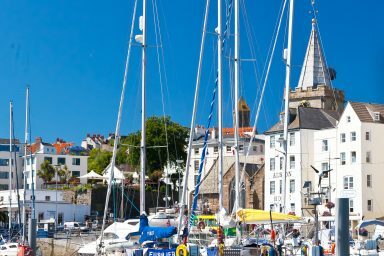 Guernsey has a rich history and culture, and as a result of its strategic location in the Channel it has seen many times of conflict, changing hands from France to the United Kingdom. More recently it was invaded by the German Army during World War Two, and the forts, bunkers and batteries built during the war are still dotted around the island today. Guernsey’s tidal range of 33 feet is one of the largest in the world. It means the island’s stunning coastline can look different from one minute to the next and ensures the views never get boring. The tricky waters also attract sailors from around the world looking for a challenge. Locals sell homegrown flowers and fresh produce from unmanned stalls outside their homes. Affectionately known as ‘Hedge Veg’ they are run on an honesty system. 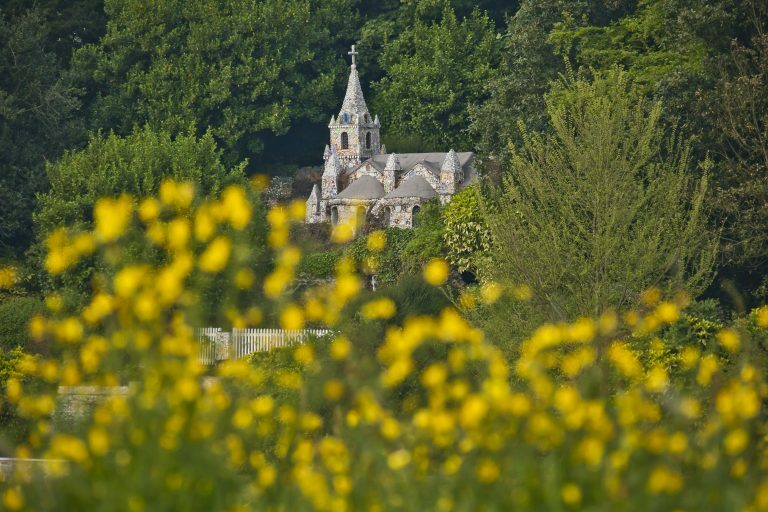 The maximum speed limit is 35mph, which drops down to 15mph in rural lanes known as Ruette Tranquille where walkers, cyclists and horse riders have propriety. Parking is free with a parking clock system in operation in areas where the length of time of parking is restricted. There are only 7 roundabouts in Guernsey. The island uses a ‘filter in turn’ system at many junctions, marked by a yellow grid on the road. All directions have equal priority and vehicles ‘filter’ through the junction in turn. Guernsey has their own sterling currency, albeit equal in value to UK sterling, with paper one pound notes. UK sterling is accepted throughout the island. Guernsey’s number plates are made up entirely of numbers and can be black or yellow. The registration number 1 is on the Bailiff of Guernsey’s car. The post boxes are blue. 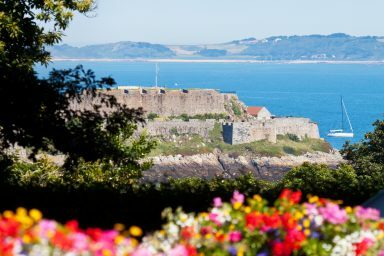 Guernsey’s location between France and England has made it strategically important throughout history and numerous fortifications can be seen around the island from various periods of time, up until the German occupation of the island during the Second World War. Flights into Guernsey offer passengers an incredible bird’s eye view of the island as a whole. If approaching over the East coast you may even be able to spot the Fermain Valley Hotel.